...or you can call us! For current studio hours please check our time table. Clinic 88 has the most experienced group of Sports Massage Therapists in the Country. Sports Massage has many aspects. From pre-event warm up massage to post event cool down massage, injury prevention to maintenance. 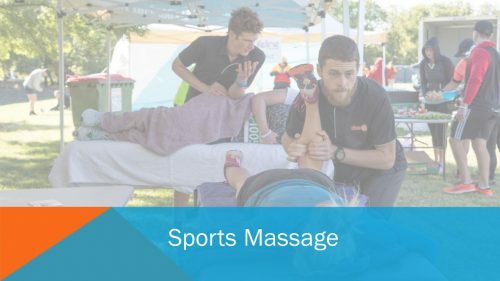 Pre-Event massage generally takes place at the event site and within 20 mins of the start of exercise. The general idea is to increase peripheral blood flow, increase neural activity and awareness. The massage should take place while the athlete is sitting up as when you lie down (and even more so when you close your eyes) your body produces particular blood constituents that makes you tired and ready for sleep. You would only ever do this for those people who are over excited or are involved in a sport that necessitates a calm demeanour like archery. The techniques should be light in depth but vigorous in nature. The vigorous action will increase peripheral heat and mobilise the connective tissues of the area treated, making them more fluent/mobile. The heat developed in vigorous massage helps ‘warm up’ the treated muscle groups making them more prepared for activity and reducing potential injury. deep massage should be avoided in big prime mover muscles (the big muscles that create power like pecs and hamstrings) as this can potentially create a feeling of lack of coordination or discomfort (or both). The only time a prime mover should be massaged at depth in a pre-event massage is when there is a pre determined reason such as old scar from an injury or chronic tightness (always do this at a training before attempting at game so the athlete can feel the result). Pre-event massages should generally last approximately 5-7 minutes and can incorporate some stretching if indicated. Post-event Massage is an attempt to restore the body to its pre-event state. In this circumstance the athlete should be lying down to encourage blood back to the heart and out of the periphery. Note that the athlete should always have performed their warm down prior to a post event massage (usually a reduced effort of the same type of exercise – light jog if running, slow swimming if swim race, etc). This is by far the best way to reduce lactic acid build up and reduce muscle soreness. Post event massage has little affect on lactic acid removal (some evidence that it helps a little bit) hence the athlete performing their post event warm down prior to massage. reduction in muscle tone that has increased during exercise. This may include cramp. restoration of range of motion. This may include light stretching. there are a number of physiological affects that science hasn’t quite worked out yet. All these are very difficult to measure as it is often the athletes perception rather than a quantitative event (measurable). Hence there is poor scientific evidence although the anecdotal evidence is strong. Maintenance massage is the most sort after type of sports massage in the clinical setting. Importantly the athlete should have a predetermined idea of what they want/need and make sure that is passed on to the therapist. If you are unsure then make sure you ask the therapist what they believe is best for your current situation. Please don’t just jump on the table and expect exactly what you after as there are plenty of different types of maintenance massage possibilities and a good relationship between the therapist and athlete is essential (and often with the coach, strength and conditioning staff if in an elite setting). Hence if you are after a broad handed rhythmical type sports massage (often called a ‘flush’) then you need to suggest this. If you want it light then tell the therapist (they should ask you anyway), if you want light on the calves, heavy on the hammies and some range of motion stuff around the hips then ask for this. If you have no idea what you want or need, then ask the therapist. If you want to get serious then ask for a screening! Then you will have identified areas of weakness, tightness and a focus on your treatment clinically and at home. ‘Flush’ which is a broad handed type rhythmical massage (similar to post event) with occasional deeper strokes (where areas of tightness are identified or known chronic tightness). The techniques used in sports massage can range from stretching, light strokes to deeper strokes, trigger point work, even dry needling in particular circumstances. The work that you receive will be determined by what you ask for, your sport, your circumstances, your injury if you have one, your level of training, etc, etc. Be prepared to have a conversation with your therapist to ensure you get what you are after. Recovery. All these factors above are important aspects of recovery. While you recover by re-hydrating, nutrition, rest and sleep, stretching, ice baths, etc, sports massage will address those aspects that cannot or have missed.